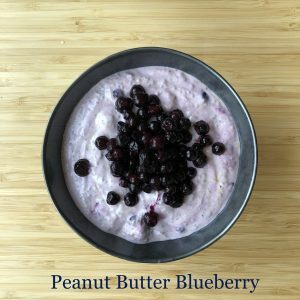 This is part of my “3 Yogurt Bowl Recipes” video along with my Banana Mocha Yogurt Bowl and Raspberry Earl Grey Yogurt Bowl. You can find more info on the Banana Mocha post and a link to my video as well. In a small bowl combine half of your yogurt, all of the peanut butter, cinnamon, chia, and bee pollen; mix with a spatula really well until the peanut butter is completely combined into the yogurt. Add in half of the blueberries and mix them in. Add in the remaining yogurt, mix until well combined. Top off with the rest of your blueberries. Chill for at least 4 hours (to allow the chia seeds to soften) or store for up to 3 days covered in the fridge.